Extracorporeal membrane oxygenation (ECMO) has been used sporadically in trauma patients, most often for post-traumatic acute respiratory distress syndrome (ARDS). Here, we report the use of ECMO as an initial treatment modality for acute respiratory failure secondary to massive pulmonary contusions in a 17-year-old male with concomitant intracranial hemorrhage. Blunt trauma to the thorax can on rare occasions lead to early severe hypoxemia from pulmonary contusions; more commonly, the hypoxia associated with pulmonary contusions is most pronounced hours to days after the initial injury. Extracorporeal membrane oxygenation (ECMO) has been used as a salvage therapy in these patients who have failed conventional ventilator strategies. While the uses for ECMO in the non-acute setting continue to expand, the use of ECMO in trauma has stagnated and remains controversial, despite studies reporting survival rates between 50% and 79% [1-3]. Risks such as hemorrhage, thrombosis, and limb ischemia, as well as physician unfamiliarity with ECMO technology, serve as barriers to the widespread use of ECMO in trauma patients . In this report, we describe a patient with severe pulmonary and myocardial contusions producing refractory hypoxemia and hypotension, along with intracranial hemorrhage. The patient was quickly treated with veno-arterial ECMO for cardiopulmonary support and was stabilized and eventually discharged with minimal functional deficits. A 17-year-old male was a restrained front-seat passenger in a high-speed single vehicle collision. The driver was found deceased and the patient unresponsive at the scene. Emergency services technicians intubated the patient and performed bilateral needle thoracostomies followed by bilateral tube thoracostomies, draining 600 mL of blood. The patient was initially transported to an outside hospital but was subsequently transported by air to our level one trauma facility as a top tier trauma activation. 45 minutes post-trauma he arrived with an initial blood pressure of 89/61 mmHg; heart rate 116; an Sa O2 of 57%; and on sedation, his Glasgow Coma Score was 3T. The tube thoracostomies had active air leaks bilaterally with low volume sanguineous output. A large bore infusion catheter was placed in the right femoral vein and an arterial line was placed in the right femoral artery. The patient received 4 liters of crystalloid and 2 units of O-negative blood in our trauma bay. The patient’s abdomen was soft and non-tender; a focused abdominal sonogram for trauma was negative. A portable chest radiograph showed bilateral pulmonary contusions with subcutaneous emphysema, pneumomediastinum, and right clavicular fracture. There was poor respiratory rise and air entry was weak bilaterally. Bronchoscopy was performed and no significant large airway injury was identified. His Pa O2 was 30 mmHg on 100% Fi O2, with tidal volumes of 300 ml and peak airway pressures of 45 mmHg despite chemical paralysis. The ECMO team was mobilized and the patient was systemically heparinized with 7,000 units of heparin, resulting in an activated clotting time (ACT) of 208. The right femoral artery and femoral vein were percutaneously cannulated via modified Seldinger technique. Veno-arterial ECMO was initiated and flows between 4 and 4.5 L/min were achieved. Hemodynamic status and gas exchange improved rapidly. CT of the brain showed small frontal contusions and intraparenchymal hemorrhage with intraventricular components. CT of the c-spine showed a fracture of the T1 transverse vertebral process. CT of the chest showed severe bilateral lung contusions with pneumomediastinum (Figure 1). CT of the abdomen and pelvis showed no obvious injuries. The patient was then transported to the cardiovascular intensive care unit and maintained on the oxygenation circuit without additional heparinization. 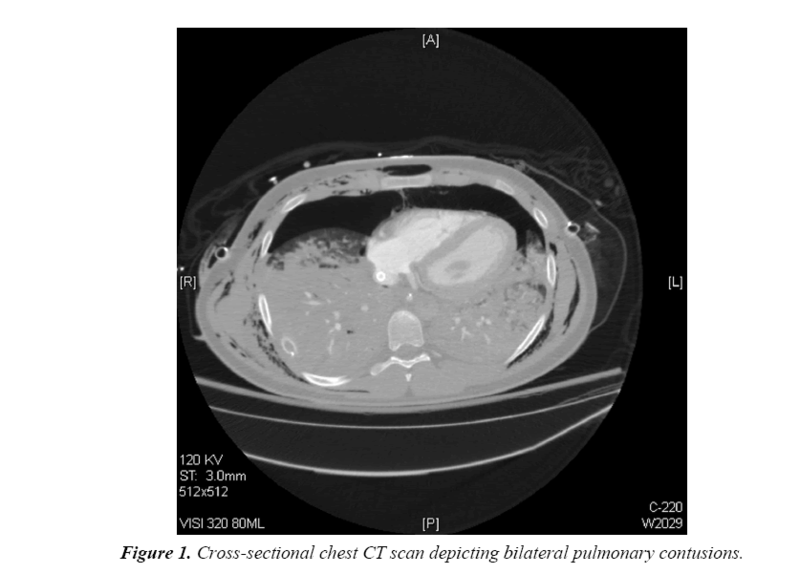 Figure 1: Cross-sectional chest CT scan depicting bilateral pulmonary contusions. The next day, planned vascular assessment of the right leg via color Doppler revealed inadequate perfusion. A retrograde perfusion cannula was emergently placed in the right posterior tibial artery via modified Seldinger technique, reestablishing perfusion and preserving the right lower extremity. After a repeat CT scan of the head revealed that the patient’s intraparenchymal hemorrhage and intraventricular hemorrhages were stable, and 24 hours after initiation of ECMO, the patient was started on therapeutic unfractionated heparin with a target ACT of 180-220. The patient remained hemodynamically stable and was successfully weaned from ECMO four days later. Flows in excess of 4.5 L/min were maintained throughout the circuit run without need for membrane oxygenator replacement, despite the period of running the circuit without heparin. During decannulation, a thromboendarterectomy was performed to remove a large thrombus found at the site of arterial cannulation. The patient was admitted to an inpatient rehabilitation facility 25 days after the initial trauma and was discharged to home 47 days post-accident. Today, the patient has experienced marked functional recovery, is fully employed and living independently. He has a disability rating of zero (0) according to the Disability Rating Scale . The role of ECMO in trauma has continued to evolve since 1972, when Donald Hill first reported its use to treat a trauma patient with respiratory failure . Blunt thoracic trauma can cause both pulmonary and cardiac contusions, resulting in acute lung failure and cardiogenic shock, respectively. ECMO utilization in patients with respiratory failure due to trauma has been frequently described and analyzed [7-13]; however, reports of ECMO use in trauma patients experiencing cardiogenic shock are not as common [14-16]. Furthermore, the majority of medical centers that report their experience with ECMO and its use in trauma are located outside of the United States, primarily in Europe or Asia [7,10-15,17]. Overall, there is a scarcity of data from American centers regarding ECMO and trauma. This shortage may be due to the infrequent use of ECMO in the traumatically injured patient in the United States. Vogel et al. utilized the National Trauma Data Bank to identify seventyeight trauma patients treated with ECMO out of 245, 950 total trauma patients in the United States between 2007 and 2009. Of the 682 centers that reported data, only forty-two centers, or 6%, utilized ECMO over the three-year period. Only three of these centers initiated ECMO on five or more occasions and only one center initiated ECMO on more than ten occasions . A similar study performed by McMullan et al. analyzed the same data bank for trauma patients placed on ECMO between 2012 and 2014. Eighty patients over the three-year period were placed on ECMO by forty-three different centers; only two of these fortythree centers initiated ECMO on more than five occasions . The vast majority of these patients are placed on veno-venous ECMO for secondary lung injuries from contusion, aspiration, or transfusion related acute lung injury, well after the risk of acute intracranial hemorrhage has passed. The use of ECMO in the traumatically injured patient has been approached with apprehension, contributing to its uncommon initiation in medical centers, particularly in America. The fear of ongoing hemorrhage, be it intracranial or otherwise, as well as the cost of ECMO and inexperienced staff are cited by some practitioners as barriers to ECMO implementation . When used as salvage therapy, ECMO has been associated with high survival rates among trauma patients, ranging from 50% to 79% [1-3,7-9,11,13,17,18]. Additionally, some studies suggest that ECMO may be beneficial, even if bleeding is present [1,7]. Smith et al. analyzed the international Extracorporeal Life Support Organization (ELSO) registry and identified 85 patients between 1998 and 2014 who sustained blunt thoracic trauma and were placed on ECMO. The authors reported hemorrhagic complications due to ECMO in 29.4% of patients, including surgical and cannula site bleeding and hemolysis . As previously mentioned, our patient developed diminished perfusion in the right leg secondary to arterial cannulation one day after initiation of ECMO. Decreased perfusion leading to limb ischemia is one of the most common adverse events associated with veno-arterial ECMO, primarily resulting from obstruction of the femoral artery due to the large size of the arterial cannula . Insertion of a distal perfusion catheter (DPC), as was performed in our patient, is an effective method of restoring perfusion to the distal extremity and can even be inserted at the initiation of ECMO as a form of limb ischemia prophylaxis. In a retrospective review, Lamb et al. report that, of ninety-one patients placed on veno-arterial ECMO, there was no occurrence of limb ischemia in the fifty-five patients who received DPC at the time of ECMO initiation. Of the remaining thirty-six patients without DPC, twelve patients developed limb ischemia . Other methods of reducing the incidence of limb ischemia include educating staff on the signs of decreased perfusion, using ultrasound to gauge the size of the femoral artery to inform selection of cannula size, and therapeutic anticoagulation [19,20]. Despite the potential for complications, studies show that ECMO can be safe and effective as salvage therapy in trauma patients. While there is increasing evidence that adverse events associated with ECMO can be safely managed and even prevented, some physicians remain speculative of the therapeutic benefits offered by ECMO to trauma patients. The case described in this report exemplifies the role of ECMO in trauma by demonstrating its life-saving capability and lending evidence to the notion that the benefits associated with its implementation outweigh the risks. We believe that in certain cases, aggressive early initiation of extracorporeal life support deserves consideration as it may be the only chance for meaningful recovery. Bedeir K, Seethala R, Kelly E. Extracorporeal life support in trauma: worth the risks? J Trauma Acute Care Surg. 2017;82(02):400-6. Burke CR, Crown A, Chan T, et al. Extracorporeal life support is safe in trauma patients. Injury, International Journal of the Care of the Injured. 2017;48(01):121-6. Lew DF, Wray CJ, Lally KP, et al. Outcomes of extracorporeal life support in trauma. J Surg. 2014 ;2(2):1-5. Wydo S, George R. Extracorporeal membrane oxygenation: a trauma surgeon’s perspective. Mechanical Circulatory Support. 2013;4(01). Rappaport M, Hall KM, Hopkins K, et al. Disability rating scale for severe head trauma: coma to community. Arch Phys Med Rehabil. 1982;63(3):118-23. Hill JD, O’Brien TG, Murray JJ, et al. Extracorporeal oxygenation for acute posttraumatic respiratory failure (shock-lung syndrome): use of the Bramson membrane lung. N Engl J Med. 1972;286(12):629-34. Biderman P, Einav S, Fainblut M, et al. Extracorporeal life support in patients with multiple injuries and severe respiratory failure: A single center experience? J Trauma Acute Care Surg. 2013;75(5):907-12. Bosarge PL, Raffo LA, McGwin Jr G, et al. Early initiation of extracorporeal membrane oxygenation improves survival in adult trauma patients with severe adult respiratory distress syndrome. J Trauma Acute Care Surg. 2016;81(2):236-43. Guirand DM, Okoye OT, Schmidt BS, et al. Venovenous extracorporeal life support improves survival in adult trauma patients with acute hypoxemic respiratory failure: a multicenter retrospective cohort study. J Trauma Acute Care Surg. 2014;75(5):1275-81. Huang YK, Liu KS, Lu MS, et al. Extracorporeal life support in post-traumatic respiratory distress patients. Resuscitation. 2009;80(05):535-9. Kim HS, Ha SO, Han SJ, et al. Extracorporeal membrane oxygenation support in trauma versus nontrauma patients with noninfectious acute respiratory failure. Artificial Organs. 2016;41(05):431-9. Madershahian N, Wittwer T, Strauch J, et al. Application of ECMO in multitrauma patients with ARDS as rescue therapy. J Card Surg. 2007;22(03):180–4. Ried M, Bein T, Philipp A, et al. Extracorporeal lung support in trauma patients with severe chest injury and acute lung failure: a 10-year institutional experience. Critical Care. 2013;17(03):R110. Bonacchi M, Spina R, Torracchi L, et al. Extracorporeal life support in patients with severe trauma: An advanced treatment strategy for refractory clinical settings. J Thorac Cardiovasc Surg. 2013;145(6):1617-26. Bonacchi M, Vannini A, Harmelin G, et al. Inverted-Takotsubo cardiomyopathy: severe refractory heart failure in poly-trauma patients saved by emergency extracorporeal life support. Interact Cardiovasc Thorac Surg. 2015;20(03):365-71. Masiakos PT, Hirsch EF, Millham FH. Management of severe combined pulmonary and myocardial contusion with extracorporeal membrane oxygenation. The Journal of Trauma, Injury, Infection, and Critical Care. 2003;54(05):1012-5. Arlt M, Philipp A, Voelkel S, et al. Extracorporeal membrane oxygenation in severe trauma patients with bleeding shock. Resuscitation. 2010;81(07):804-9. Jacobs JV, Hooft NM, Robinson BR, et al. The use of extracorporeal membrane oxygenation in blunt thoracic trauma: a study of the extracorporeal life support organization database. J Trauma Acute Care Surg. 2015;79(6):1049-53. Lamb KM, Hirose H. Vascular complications in extracorporeal membrane oxygenation. Critical Care Clinics. 2017;33(4):813-24. Lamb km, DiMuzio PJ, Johnson A, et al. Arterial protocol including prophylactic distal perfusion catheter decreases limb ischemia complications in patients undergoing extracorporeal membrane oxygenation. J Vasc Surg. 2016;65(4):1074-9.